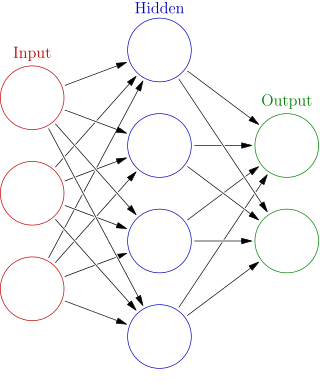 Artificial Neural Networks were first conceived of in the 1940s, but they were of only theoretical interest until some 3 decades later, when the invention of the backpropagation algorithm began to open up the possibilities for practical implementation in software. Along with tremendous advances in computer processing power, and powerful numerical software libraries, its now possible to write useful programs to solve a wide variety of tasks, like computer vision and speech recognition. A biological neuron is an electrically excitable cell that processes and transmits information through electrical and chemical signals. These signals between neurons occur via synapses, specialized connections with other cells. Neurons can connect to each other to form neural networks. Dendrites are hair-like extensions of the soma which act like input channels. These input channels receive their input through the synapses of other neurons. The soma processes these incoming signals and then sends that processed value into an output which is sent out to other neurons through the axon and the synapses. An artificial neural network in AI is a program, or programming paradigm, inspired by the way the brain appears to work, at a low level. 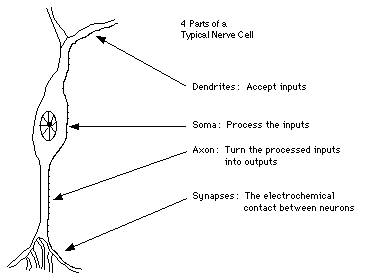 Each neuron receives a number of inputs. Each input’s value is multiplied by a weighting factor for the input channel, then all of the inputs * weights are summed. The initial weights are chosen at random. This sum passes into an activation function which determines the ‘firing value’ of the neuron. A typical activation function is the sigmoid function. A sigmoid function is a mathematical function having an “S” shaped curve (sigmoid curve). Often, sigmoid function refers to the special case of the logistic function defined by the formula S(x) = 1/(1 + ex). There may be a threshold value which the sum must exceed for the neuron to fire. Neurons are grouped into layers, so that there is an input layer, an output layer, and in between are 1 or more ‘hidden’ layers. The input layer is fully connected (each neuron’s output goes to all the neurons of the next layer) to the first hidden layer, which is then fully connected to the next layer, and so on. At the final layer (the output layer) these ‘guesses’ are compared to the expected results for each given input. Of course, these initial guesses are likely to be terribly wrong! So we compute the sizes of the errors, and the directions that the weights need to be adjusted and backpropagate this information to the previous layers so that they can tweak the weights. This process is called gradient descent. Then we run the forward phase again. This is repeated several times, maybe even thousands or millions of times, and the guesses improve. 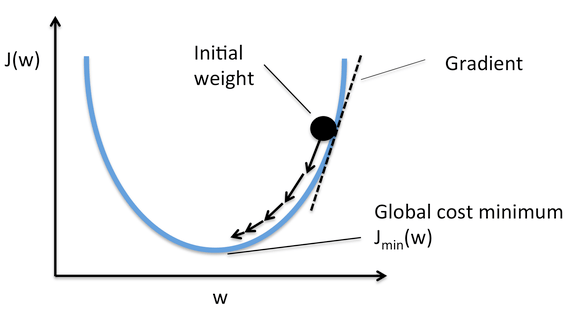 Gradient descent utilises a loss function (sometimes referred to as the cost function or error function), which maps values of one or more variables onto a real number intuitively representing some “cost” associated with the weight vector. It calculates the difference between the input training example and its expected output, after the example has been propagated through the network. are the weights on the connection from the input units to the output unit (in the case where the neuron has 2 inputs). 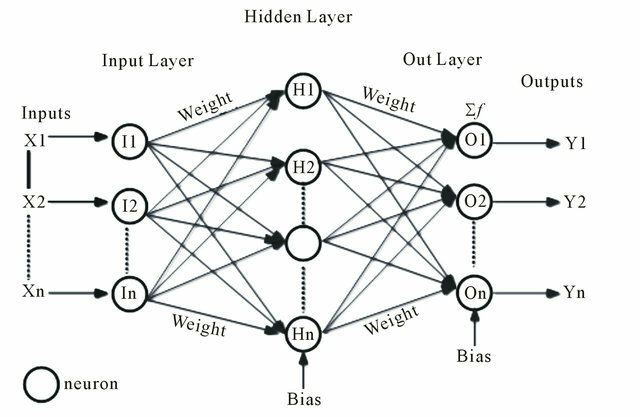 Therefore, the error also depends on the incoming weights to the neuron, which is ultimately what needs to be changed in the network to enable learning. dimensions. The backpropagation algorithm aims to find the set of weights that minimizes the error. This structure can be shown to be capable of learning, such as performing fundamental logical operations, performing simulations of mathematical functions, playing games, recognising handwriting, speech, items in pictures, and so on. The field has advanced incredibly in recent years, such that these programs can match or even surpass human experts. This is in contrast to ‘algorithmic’ programming, which depends on explicitly specifying the steps required to solve a problem. This can easily become too complex and unwieldy for practical purposes, but an ANN operates more like humans by learning from examples – lots of them.